A Special Internet Offer for our internet visitors to try our programs. ...Through this special internet offer which includes 30 days of unrestricted classes and has a real-value of $100! For Teens & Adults who want "Just Enough"
...use the convenient "Contact" form here. When you contact us, we'll set up an appointment so you can meet us and we can meet you. 1) You will take a tour of our professional martial arts academy. If you're even mildly interested in Japanese decor, you'll love the traditional scrolls and other artwork, bubbling ponds and live plants, and traditionally styled training rooms that set this academy apart from so many others. In fact, many people have commented that the academy looks more like a museum or art gallery than a martial arts school! The atmosphere is designed to help you relax, focus, and experience what it feels like to train in an authentic Japanese Dojo ("training hall"). 2) You will sit down with our program director and participate in a Personal Analysis. During this time, we'll assess what your primary goals are and whether our programs are right for you. We know that our programs are not for everyone. By the end of this goal assessment, you will know whether or not WCI is what you're looking for. ... we will suggest another program being offered in the area that best meets your needs. 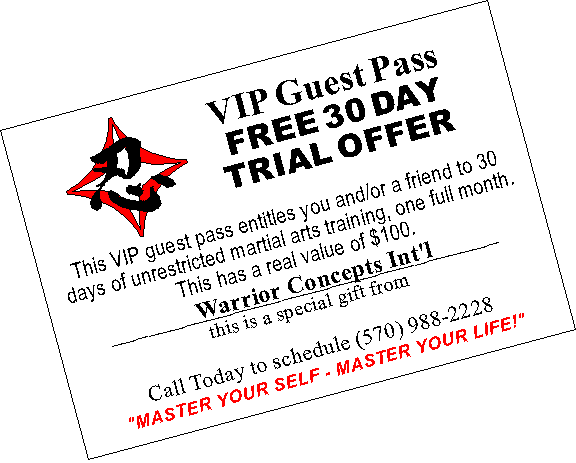 3) Finally, this internet offer allows you the opportunity to take your first Black Belt Mastery class and see for yourself how the unique Warrior Concepts Life Mastery Program will help you achieve your goals! ... you will take away techniques, tactics and strategies that you can start using right away! 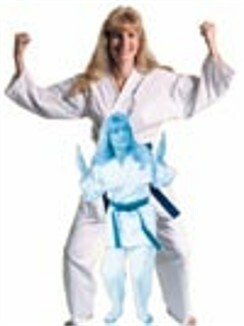 If all goes well, you'll then be shown how to get started on your way to Black Belt! All new students receive, as a part of this internet offer, a $100 credit off the program of your choice. ...if you're a parent looking for proven results when it comes to helping your child with life-enhancing traits like confidence, discipline, and respect, we can help. ... it's ultimately up to you as to whether you take action and contact us. For more information, to take advantage of this internet offer and schedule your complimentary tour and Black Belt Mastery Class, or simply to ask a question - give us a call and let us see if we can help. You can also get additonal information about the different programs and facets of the training by clicking on any of the links along the left side of this page. The academy is located at 362 Market Street, in Sunbury. Stop in or give us a call at (570) 988-2228.